It’s always been a difficult and tedious task to choose the best stick vacuum cleaner which suits your life; with the varied range of types, features and price of the product you have choice. Stick vacuums are generally unique from other products basically because of their lightweight construction and their ability to easily move and be effortless. Generally, many vacuum sticks require more power to tackle floors and rugs. Best suited for light cleaning and on hard surfaces, this type of vacuum cleaner may fail to perform well on thick rugs and carpet floors. Click here for call us at our location to get more info on the best stick vacuum for pet hair. Different stick vacuums have unique features than others. The most important consideration is its size and weight. Most vacuum cleaners weigh less than 10 pounds and others may weigh less than 5 pounds or even less than that. Since stick vacuums are often used for quick cleanup ease of storage is also a factor some may stand for storage. In case of a cordless stick vacuum, the main consideration is its battery life. Some cleaners may run for about 20 minutes just in a single charge, which is basically optimal for light cleaning of your home. Cordless vacuums from all outstanding brands such as Dyson, Vax as well as Bosch, comes under the category of best leading cordless vacuums based on our preference. Browse our upright vacuum bags here. Cordless stick vacuums are the most maneuverable and highly versatile traffic cleaners. Stick vacuums are ideal for quick clean-ups, homes with hardwood or tile floors; they can be stored in a small space and are light and maneuverable. Get more infomation about us and the best stick vacuum cordless rechargeable here. The cordless stick vacuums are now been designed with enough battery life to clean your whole home quickly and smaller sizes. They are versatile and convenient in nature. These are also great if you have back issues and struggle with heavy vacuums. Stick vacuums make doing stairs much easier and quick clean-ups a breeze. • Compared to full size vacuums corded stick vacuums are much less expensive but are more limited in their suction and capacity. The cordless offer the same capacity and suction but with the added advantage of the freedom of no cord. Price will be the difference between the corded and cordless versions. • Cordless stick vacuums will have different battery life as well as the time to charge will vary. Some higher end models may come with an additional battery for convenience. • Cordless models also allow you to use them where a corded model cannot easily reach. Corded Stick Vacuums are a scaled down lighter version of a regular vacuum. They are basically easy to handle when compared to ‘regular’ upright and Container models. These vacuum cleaners are best as secondary home vacuum and also as a main vacuum for those who cannot handle larger vacuum. High-end corded stick vacuums are designed with different attachments for cleaning various surfaces, may have more suction and also larger battery life. For more reviews on best stick vacuum for hard floors click here. Best corded stick vacuum for laminate floors. It’s important to consider the stick vacuum ratings before buying the new stick vacuum cleaner. The wise choice is to go through the individual opinions about products and also the recommendations of the product. • Battery Voltage – Usually, Greater voltage of the Vacuum cleaner will help you to get better suction with less battery usage. The additional Benefits are less warmth dissipation as well as minimum wear on wires and the electric motor. • Type of the Battery- Different batteries have different capacities resulting in length of time to charge, how long the vacuum will run on that battery and the overall life of the battery. • Additional accessories, brushes, nozzles, extension rods or tubes for getting cobwebs or cleaning lights and curtains. • Ease of emptying the container, capacity of the container, cleaning filters and how it can be stored, whether it hangs, stands or sits on a charger. Read more Dyson reviews here. Stick vacuums are a great addition to any home for quick clean-ups, tricky or small areas, stairs, hard flooring, outdoor areas and for people that have issues with a heavy vacuum. They are less expensive than their full size counterparts. 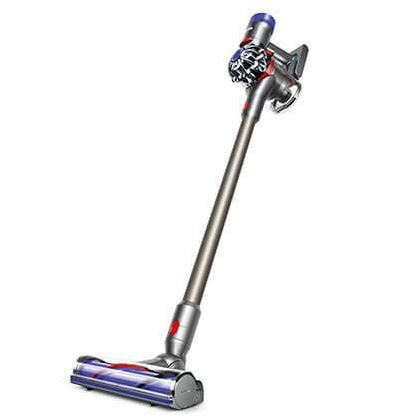 Contact us today to find the best stick vacuum cleaners along with other vacuum sales available.